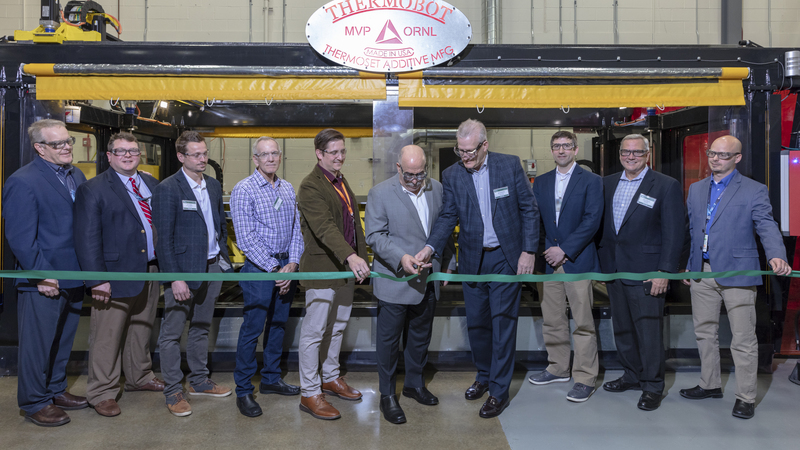 Magnum Venus Products (MVP), in partnership with Oak Ridge National Laboratory (ORNL), recently celebrated the installation of the first commercially available medium/large-scale thermoset 3D printer at the Department of Energy’s Manufacturing Demonstration Facility at ORNL. MVP and ORNL hosted a a ribbon-cutting ceremony on April 5, 2018. While 3D printers have been around for years, the additive manufacturing industry has needed a cost-effective solution that could print structures and molds. MVP engaged with ORNL to create this 3D printer capable of printing large-scale thermosets, chemistries that are irreversibly cured from a prepolymer or resin. The MVP machine features a state-of-the-art gantry system tailored to the application, developed in response to growth in 3D printing, a market demand for hyper-customization, and the need for advanced manufacturing automation. The ability to print thermosets on a large-scale opens new possibilities with respect to the performance and integrity of printed structures. The roll-in/roll-out bed configuration of the MVP thermoset printer dramatically increases the productivity of additive manufacturing. The configuration allows the printer to operate while pre- and post-processing operations are performed on an additional print bed outside of the machine. The benefits include rapid prototyping molds, rapid mold building, and creativity with an all-new material for cutting-edge companies. It also includes the ability to print new structures with materials more tailored to strength than traditional thermoplastics. Deposition rate ≥ 10 lbs./hr. The Manufacturing Demonstration Facility is supported by the DOE Office of Energy Efficiency and Renewable Energy’s Advanced Manufacturing Office. AMO supports early-stage research to advance innovation in U.S. manufacturing and promote American economic growth and energy security. For more information about the world’s first commercially available medium/large-scale 3D printer, please visit www.mvpind.com/blog.